I've been thinking a lot about how we can take small steps in our everyday lives to help with healing. Yoga, energy work, or therapy - these are all fantastic options, but aren't necessarily something you may have the time, money, or desire to do everyday. But everyone has 5 minutes to help alter their mood, and I was thrilled to speak to Stefanie Grant-Cassel about one simple step anyone can take to brighten their mood. Stefanie founded her line of handmade perfumes and body care Twinkle Apothecary in October 2015 after struggling to find a natural, vegan, and cruelty-free deodorant that was effective enough to keep her smelling great while working under pressure as a fashion production assistant in Los Angeles. After realizing that the deodorant she made in her kitchen was 1000 times more effective than anything from the store, she was inspired to quit her job in LA and move home to Oklahoma City to make her natural deodorant, perfume, and body care full time. 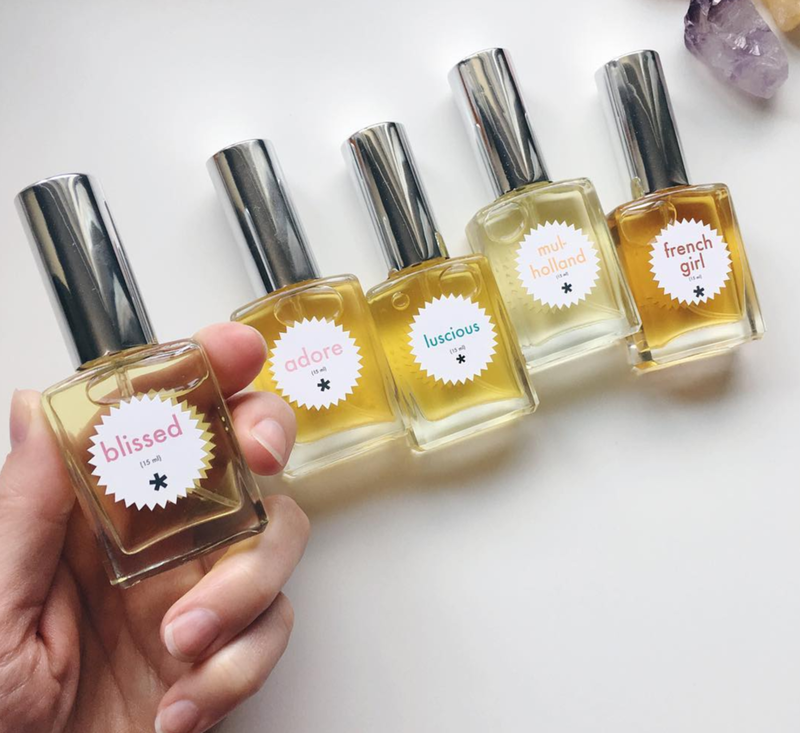 Almost two years later, this self-taught perfumer has created 15 signature fragrances with matching body and hair care products, as well as a line of customizable DIY inspired facial care items. When she’s not working, she enjoys every moment get can get with her 4 year old son, and blogs about vegan fashion, perfumery, skincare, and everything else on her personal blog, Spark Life and (Vintage) Style. Aromatherapy is broadly defined as the act of inhaling or applying plant-based aromatic substances to enhance one’s wellbeing. It’s a holistic, mind-body-spirit approach to wellness, which focuses on emotional aspects of health in addition to treating the physical body. A licensed aromatherapist (which I am not) is someone who is trained to use essential oils therapeutically to treat both physical and emotional health conditions, but in the broader sense, aromatherapy is something that anyone can practice. Any time you smell a plant or an essential oil and become mindful of the effect it has on you, you’re practicing aromatherapy! And what are essential oils (and are they essential)? Oh yes! They are essential to the plants that they’re derived from and they are essential to aromatherapy. Essential oils are not actually oils, but rather, are highly concentrated chemical substances made up of the aromatic molecules produced from plants. They can be extracted from fruits, flowers, trees, grasses, roots, and resins by a variety of different methods, the most common being steam distillation and cold pressing. In aromatherapy, we’re basically borrowing these complex substances that plants have produced for their own biological adaptive purposes - whether to attract pollinators, or to protect themselves from disease or environmental predators - to assist in our human biological systems, either though inhalation or bodily application. When an essential oil is extracted from a plant by a chemical method, it’s called an “absolute.” Because the chemical structure is altered when making an absolute, they aren’t typically used for therapeutic purposes (such as in first aid or skincare,) but they can still have an effect on our emotional state. Natural, plant based fragrances are key to practicing aromatherapy, because while the basic characteristics of a scent can be replicated in a lab, the extremely complicated exact chemical makeup (and life-force) of a plant essence cannot, and this mother-nature made magic is really what we’re going for when using plants for therapeutic purposes. How did you first get interested in aromatherapy? 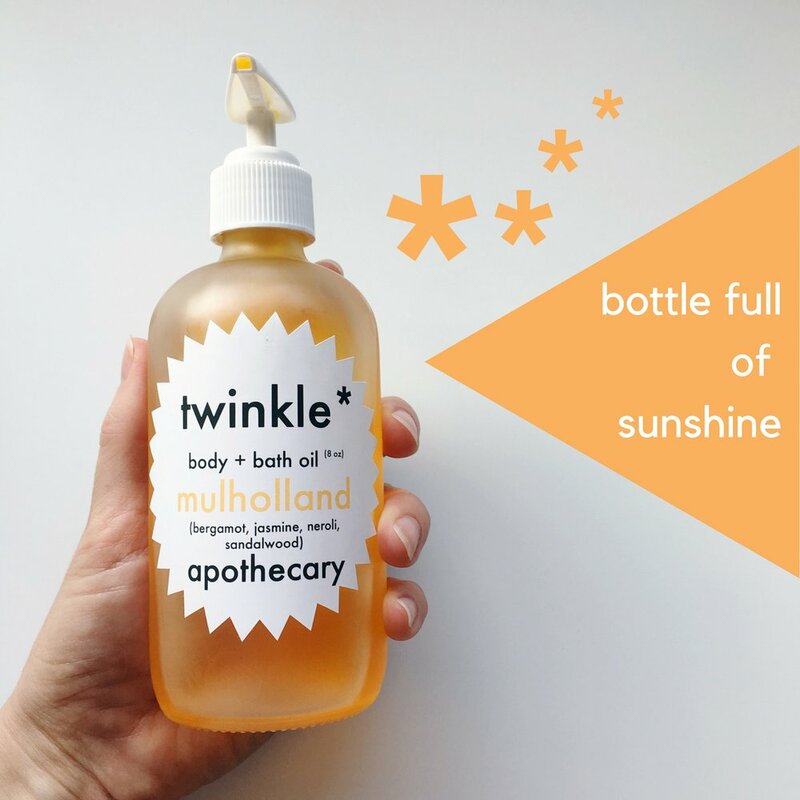 I’ve always been intrigued by fragrances but I have a very sensitive, picky nose, and I started Twinkle Apothecary because I wanted to create a variety of unique, affordable perfumes that were also completely natural, because real, plant-based fragrances just smell better to me than the synthetics found in most mainstream perfumes. In the beginning, my approach was to think of my perfumes like any other fragrance, but the more I worked with the essential oils and began to notice the profound effects they were having on my emotional state of mind, the more I was inspired to go deeper and learn about aromatherapy and how we can use the products that we put on our body everyday as a more mindful approach to wellness and self care. The more I learn, the more I realize there is to explore! How do scents affect us and our moods? Scents affect us in a variety of different ways, both physiologically and emotionally. Physiologically, the chemical components of essential oils affect our physical body - like, how mint and eucalyptus have a cooling sensation, or clove and ginger are warming. Essential oils like lavender and clary sage have relaxing effect, where as palmarosa and black pepper are energizing stimulants - these variances are all due to the different chemical structure of the plant molecules and how they react with our nervous system. Emotionally, different scents can have different effects on different people, based on their own unique perspectives and/or history with the fragrance. Like, although most people would agree that rose has an uplifting effect emotionally, if you’ve lost someone you’ve associated with the scent of roses, it may not feel good to you at all. I have a terrible sense of smell so I am definitely the wrong person to talk about this, but I know that generally scents can be very powerful in bringing up memories. Have you found this to be true? Haha - that made me chuckle because I have the opposite problem - my nose notices EVERYTHING! My family actually used to tease me about it growing up because I would annoy everyone by pointing out every smell in the vicinity and how I felt about it (usually I was not pleased so I can see how that would be annoying.) Now, thankfully, through my work I’ve discovered that my sensitivity is a gift which allows me to share my stories and connect with people all over the world through good fragrances! But to answer your question - yes, and, there’s a scientific reason behind it! It’s because of our brain anatomy. Smells go from the nose straight into the olfactory bulb, which runs along the bottom of the brain and is connected to the amygdala and hippocampus, which are tied to emotion and memory. Visual, auditory, and tactile sensations don’t pass through these areas so they don’t pack quite the same punch. I am not a scientist, so I am paraphrasing all of that, but I think it helps explain why you can smell something out of nowhere and without thinking about it at all, immediately be transported back to childhood, or another part of your life, even if you can’t quite put your finger on what it is you’re smelling. Personally, I have such strong emotional and memory associations with fragrances that I’ve actually gotten into the habit of changing my perfume often to mark new occasions, chapters, and even subtle internal shifts in my personal life. As someone who can get shockingly sentimental over a random drop of sandalwood oil, (which can be kind of inconvenient when making perfume is your job) it helps me to know that A) I’m not alone and B) There’s a scientific reason behind it! What are some ways that we can use scents? I know that there's obviously wearing perfume, but are there other ways we can add scents into our day or into specific times when we need their help? Oh, there are so many ways! Once you start to pay attention to fragrance, you’ll notice that it’s all around you, and you can use it to your advantage to evoke the feeling or tone you want to set in your personal space. In addition to wearing perfume or naturally scented body care products, you could use natural cleaning products around your house, mist some lavender on your pillowcase, brew a pot of herbal tea, cook a fragrant plant based meal, peel an orange, (the essential oils of citrus fruits are in the rinds) bring a bouquet of flowers or a potted plant into your space, put essential oils in a diffuser, or even just go for a walk outside and be mindful of the scents you’re noticing and how they make you feel. You can rub the leaves of a plant between your fingers to pick up a bit of it’s essential oil (make sure you know the plant is safe!) and inhale to get a even deeper sensation. And, as Helen Keller said, sometimes all you have to do is think about a scent to bring it’s effects to you. It’s a little bit (okay, a lot) woo-woo, but I’m a fan of visualizing the smell of sage smoke around me when I want to clear away any heavy negative energy. Denial - So, I’m certainly no psychology expert, but I think of denial as survival mode. Like, you get really bad news right before you’re about to walk into an important work meeting or pick the kids up from school, and the show must go on, right? Or even if you’re alone, you might feel like you’re numb or in shock because you’re not able to process anything yet. I’d recommend whatever you find the most comforting, uplifting scent to get you through until you’re ready to process your feelings about the situation. I find that bright citrus and floral smells always make me feel better, like my Be Happy aromatherapy perfume blend - which contains pink grapefruit, bergamot, neroli, and rose. Anger - When you’re in the anger stage, it’s almost a relief because you feel like you have a reason and an excuse to justify feeling so badly. But I think it’s important to pinpoint the underlying cause of the anger and get really clear on exactly what’s bothering you so you can begin to heal. I’d recommend inhaling clarifying, cooling oils, like rosemary, peppermint, and lavender - either in the diffuser, worn as a perfume, or by giving yourself a mini massage with a body oil or butter for support as you work through anger. Bargaining - Hmm… this is a tough one. Wishing things could just be different and trying to figure out if there’s anything you can do to change the situation. It can feel a bit frantic. I think if you’re struggling to come to terms with something that’s happened, earthy scents like sandalwood, cedarwood, and patchouli can help you ground and stabilize your body and emotions. On the other hand, if you’re anticipating a loss and wishing there was some way to stop it or change the course of events, bringing your focus and attention back to caring for yourself could be helpful. An example of that from my life is right before my most recent relationship ended, a part of me knew that it was coming, and even though logically I knew it wasn't in my best interest to be in a relationship where my partner wasn’t happy and was ready to move on, I was happy, and I wanted so badly for things to remain as they were! Once I realized that I couldn’t control the outcome of the situation, I made a decision to turn everything I did into an act of self love and told myself that even though it might be terribly painful, I would still be “okay” (in the higher sense) and that I would heal eventually. It might sound silly, but I would do things like repeat the words “I love you, I love you, I love you…” to myself as I applied my favorite scent of moisturizer to my body after the shower, and it helped. Depression - Once the reality of the situation finally sets in, it can feel like the end of the world. It can also be difficult to come up with the energy to take care of yourself, even in the simplest ways. I think you just have to give yourself a break if you’re experiencing depression and do whatever it is that seems the most comforting and healing to you. Don’t force yourself to get up and do anything you don’t want to do. Rest as much as you can. I’m a big fan of baths, and anything warming or spicy is comforting to me. Applying a grounding perfume (Like my Be Calm blend) before bed or misting your pillowcase with lavender is a great way to promote restful sleep. Acceptance - I think this is where the tie to fragrance and emotions can become very interesting and in a way, gratifying. You may never feel “okay” about whatever it is that you’re grieving, but when you move into acceptance, the pain feels less raw, and scents can become a way to acknowledge memories and also move forward by noticing how your associations with them change over time. For example - My “Basic” fragrance is one of the very first perfumes that I made when I moved home to Oklahoma to start Twinkle Apothecary. Even though technically it’s a very happy, uplifting blend of vanilla, lavender, orange, and lemon, I associated the scent with my mental and emotional state at the time - lots of uncertainty, grief over leaving my life in Los Angeles behind and wondering what could have been, wondering if I was doing the “right” thing… even though my intuition told me that I needed to start this business, I wasn’t quite ready to trust it yet and I felt like I was jumping off of a cliff into uncharted waters… but just the other day I caught a whiff of it and noticed that my reaction was, “Wow. 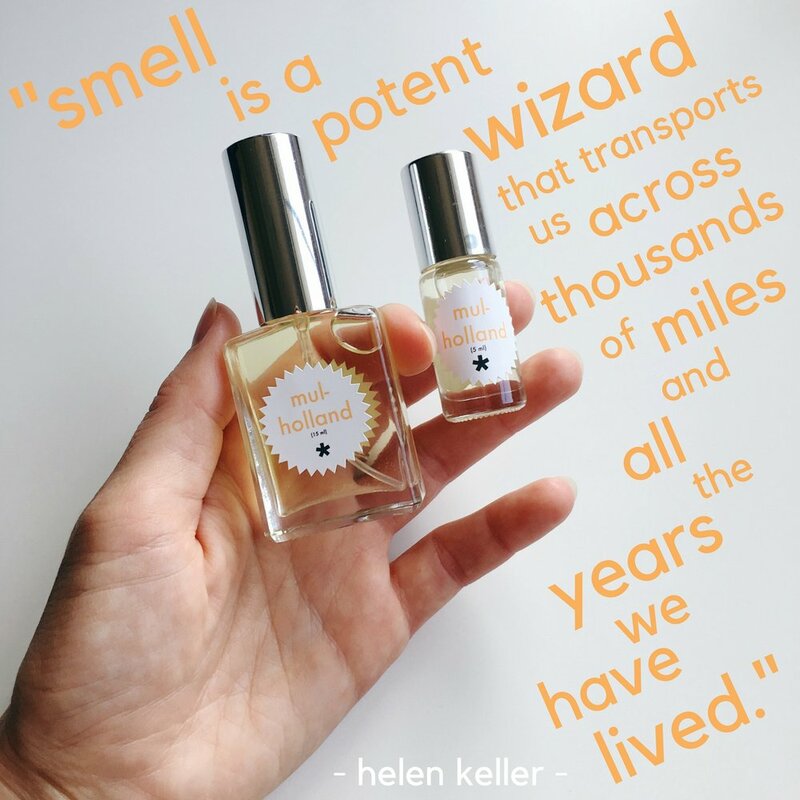 I remember what a crazy time that was for me, but now it totally smells like the best decision I ever made!” Fragrances can become markers along your journey. They can help you realize that there’s always room to grow, while at the same time remembering and honoring your past. What resources do you recommend for someone interested in learning more about aromatherapy? One of the things that I love about aromatherapy is that you can start very simply, and then get as factual and scientific, or, as mystical and spiritual as you want to go with it; and there are tons of resources out there no matter which direction you choose! Humans have been using essential oils as therapeutic and spiritual tools for thousands of years so there’s a LOT to explore. First, I would recommend by learning some basic safety guidelines and proper dilution rates, which can be found on the National Association for Holistic Aromatherapy’s website. I’d also recommend getting familiar with the essential oils that are on the GRAS “generally regarded as safe” list provided by the FDA. There is a lot of information floating around about essential oils on the internet that is inaccurate at best and harmful at worst, as essential oils can be extremely toxic. Definitely make sure you’re always adhering to those safety guidelines, use common sense, and do your own research. If you’re interested in treating health conditions with essential oils, please see a licensed aromatherapist and check with your doctor! That being said, if you’re interested in exploring fragrances from an emotional standpoint or simply learning more about aromatherapy, there’s a great list of recommended reading on the Eden Botanicals (one of my favorite suppliers) website, which I am currently trying to work my way through, and for a more mystical, spiritual approach, Tess Whitehurst’s book, The Magic of Flowers, is so much fun! The website Mind Body Green also has some great information for beginners and simple DIY recipes that you can start experimenting with, and of course I’m always working on filling the Twinkle Apothecary shop blog and Facebook page with useful information. But the absolute funnest way to explore aromatherapy is with your nose! You can start by sniffing the essential oil sample bottles at your local natural grocery store, or you can usually order small inexpensive samples from most suppliers online. (Be sure to also pick up a bottle of a carrier oil such as jojoba or fractionated coconut oil also so you can safely dilute!) 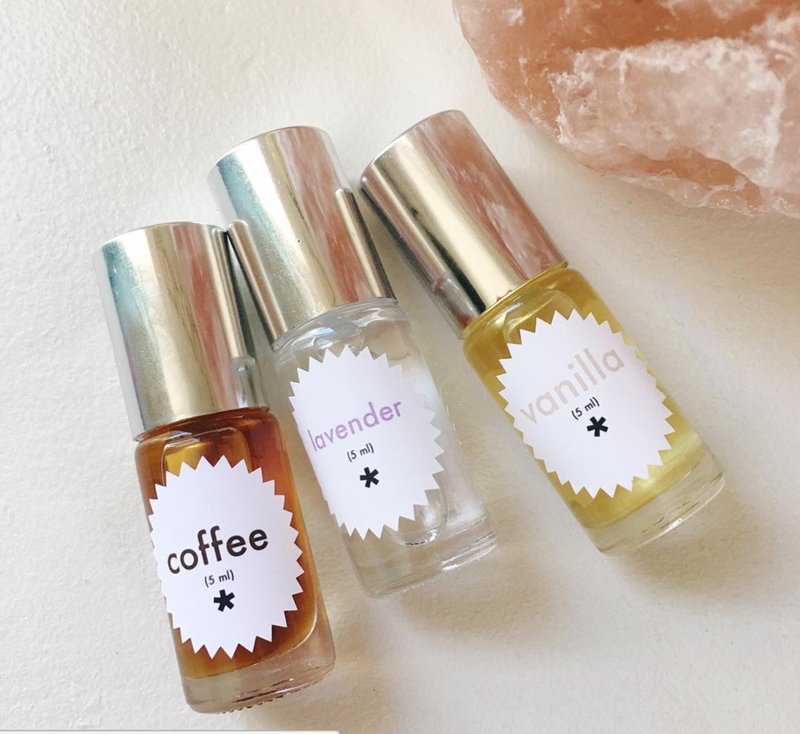 I can’t not mention that I offer 37 different (and counting) single note essential oil perfume roll-ons (so they’re already safely diluted) for $10 each, which is such an easy and fool-proof way to begin expanding your aromatic palette and experimenting with different scent combinations. Aromatherapy is intensely personal as everyone experiences fragrances differently, so I’d recommend keeping a scent journal or taking notes about what you notice about each scent and just see where they lead! I imagine it can change with the day and mood, but what's your favorite scent right now? It definitely does! I am so intrigued by and am learning to enjoy every fragrance, but I mostly tend to go for lush florals combined with woodsy, warm base notes for personal wear. Currently, however, I am wearing my Nasty Woman fragrance, which is a crisp, light, cool, yet grounding, earthy blend of frankincense, lavender, patchouli, and cedarwood. I chose it as my fall transition fragrance, because as the seasons are changing outside, I am also experiencing an internal shift, and I feel like changing up my fragrance will help support my intention to move into this new season of my life with greater clarity, certainty, and purpose. Has aromatherapy helped you through any grief, loss, or heart aches? Oh yeah. I mentioned a few examples above, and I have to say that as a very highly sensitive and emotional person I feel I’m pretty lucky to have stumbled into this career path and to have unlimited access to my products! They’re usually the first things I reach for when I need a little extra support.